I’ve often explained the reason I love Grimlock so much is that he’s both a dinosaur and a robot. What could be better? Nothing. 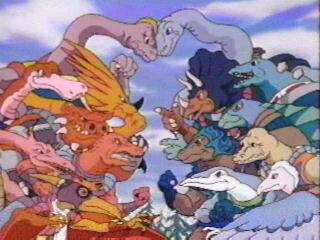 But a close second is the combination of dinosaurs and aliens, and for that, there was Dinosaucers. I remember catching the show as an early-morning treat before I went off to elementary school (it came on around 7 a.m., while at 7:30 I would watch Dennis the Menace). Dinosaucers followed a very similar formula to Transformers: two warring groups of aliens come to Earth and have at it, causing lots of collateral damage to our planet (of course, the good guys befriend some human children). Rather than giant transforming robots, however, Dinosaucers featured giant talking alien dinosaurs. The good guys were the eponymous Dinosaucers, led by Allo, while the bad guys, the Tyrannos, were led by Genghis Rex. Why the hero was an Allosaurus–the Frank Stallone of the theropod suborder–while the villain was a Tyrannosaurus is beyond me, but whatever. The characters could “dinovolve” by hitting a button on their outfit, which basically turned them from their anthropomorphic forms into traditional dinosaur shapes, though they retained their intelligence and speech ability. The series lasted the usual 65 episodes before fading into syndicated oblivion. However, like every other cartoon in the 1980s, there were toys planned–and herein lies the tragedy of Dinosaucers. Galoob scheduled a huge line of Dinosaucers toys in 1987, and even showed them at Toy Fair. There were 8″ action figures, 2″ figures with ships, and even what would easily have been one of the coolest playsets ever. When the cartoon didn’t take off, the toys were mothballed. But they got pretty close to production, though, because not only are fully-painted prototypes extant, but when Dinosaucers later aired in Brazil, a Brazilian company actually bought the unused molds and produced some of the figures. What gets me is that we could have had Dinosaucers figures, but thanks to the fickleness of my generation, the show’s Nielson ratings weren’t quite high enough to warrant production on what looks like it would have been a great line of toys. (Well, either that or Galoob blew their wad on the Star Trek: The Next Generation license.) At this point, Dinosaucers has faded so far into obscurity it will likely never see a DVD release. The prototypes, the Brazilian figures and some other Dinosaucers materials pop up with surprising frequency on eBay. It’s all very expensive, of course, and unless watching Dinosaucers was one of the formative events of your childhood, on par with getting your first videogame console or strumming an electric guitar for the first time, I suspect you won’t be willing to part with the necessary coin for any Dinosaucers stuff. Still, we can always hope they pop up as South American bootlegs! My intention with this article is not to taunt you with toys you can never have. It’s so you can share in my pain. Had the Dinosaucers toy line been given a chance, I think it would have carved a respectable niche in the crowded 1980s action figure market, and might today have the sort of cult following enjoyed by the likes of Thundercats and Silverhawks. Sadly, we’ll never know. Shine on, little Allo. Shine on. I am completely flooded with nostalgic memories for this show. I don't know that I had thought about it in maybe 20 years, but when I saw the images and the intro my mind reeled. Yeah, I totally watched this show! I used to love this show. I remember when an episode where the good guys and bad guys played a football game against each other. One of the kids told the Dinosaucers that they needed jerseys, so they showed up with shirts with the state of New Jersey on them. Classic. I freaking loved this show, and now I miss something that I had forgotten had existed. Those figures look quite good. They could have competed with TMNT I'd think in terms of cool figures for the time. Galoob never knew how to handle a product when they got it. @DMW: I totally remember that episode!!! I loved the hell out of that cartoon,and would have bought figures in a heartbeat. I remember watching the show as a kid and wishing it was Thundercats instead. The dinosaucers figures is beautiful!!!!! Seeing that clip brought back so many memories. The little "dinosaur" thing at the very end that comes at the screen gave me chills, I haven't heard that since the series ended in '88.